Biography - Clark H. Carr, M. D.
CLARK H. CARR, M. D., a physician and surgeon of Cowden, was born in Kenawha County, W. Va., August 25, 1834. His parents, John K. and Margaret (Wyant) Carr, were natives of the East, the father being born in Greenbrier County, Va., in 1812, and the mother in Lawrenceburg, Ind., in 1818. The father has been living since 1852 in DeWitt County, this State. The mother died September 1, 1891. Nine of their large family of six sons and seven daughters are still living, of whom our subject was the eldest. The brothers and sisters of our subject are Violetta, wife of James Darby, a farmer in Minnesota; John, who first married Mary Lloyd and afterward was united with Ellen Swan, with whose assistance he is now carrying on farming in Sumner County, Kan.; Julia Ann, who was the wife of Stephen Webster, and died in De Witt County, Ill., in 1872; Isaac L., a farmer near Humboldt, Iowa, who married Mary Day; Mary, who married William Stewart and died in Minnesota in 1871; Jane, the wife of Philip Shellenberger, a farmer who lives in Piatt County, this State; Sarah E., who first married William Stewart, a cousin of her sister Mary's husband and afterward became the wife of George Hitchen, of Gibson City, Ill.; Michael M., who married Sophronia Barr and lives in Piatt County; Leonard S., who married Elizabeth McMann, and resides in DeWitt County, and two children who died in early infancy. The subject of this sketch accompanied his parents from West Virginia to Indiana, thence to Missouri and in 1852 located with them in DeWitt County, Ill., where the father now resides. He received his education in the public schools of this state and was about twenty-five years old when he began to read medicine. In 1866 he commenced the practice of his profession in Christian County, but in 1873 came to Cowden, where he remained for two years and then went back to his old place in Christian County. In the spring of 1880 he returned to Cowden where he has since remained. Dr. Carr has been twice married. His first wife was Mary C. Green, who was born in Preble County, Ohio, in 1836, and married the Doctor in Indiana in 1856. One child was born of this marriage, Millard Fillmore, whose natal day was August 18, 1857. On October 31, of the same year, Mrs. Carr passed from earth, and her son was tenderly reared by his paternal grandparents. The second marriage of our subject took place October 13, 1859, when he was united with Catherine Johnson. She was born December 17, 1833 in Ross County, Ohio. The six children born of this marriage are all living. Mary C. born September 1, 1860, is now Mrs. James E. Orendoff and lives in Hall County, Neb. ; Laura E., born January 22, 1863, married Alfred E. Gross, and lives in Davis County, Neb. ; Samuel C., born December 4, 1864, is engaged in the study of medicine; Margaret E., born July 2, 1867, married William G. Banning and resides on a farm in Dry Point Township, Shelby County; Ida F., born February 22, 1868, and Catherine J., born April 10, 1871, are at home with their parents. 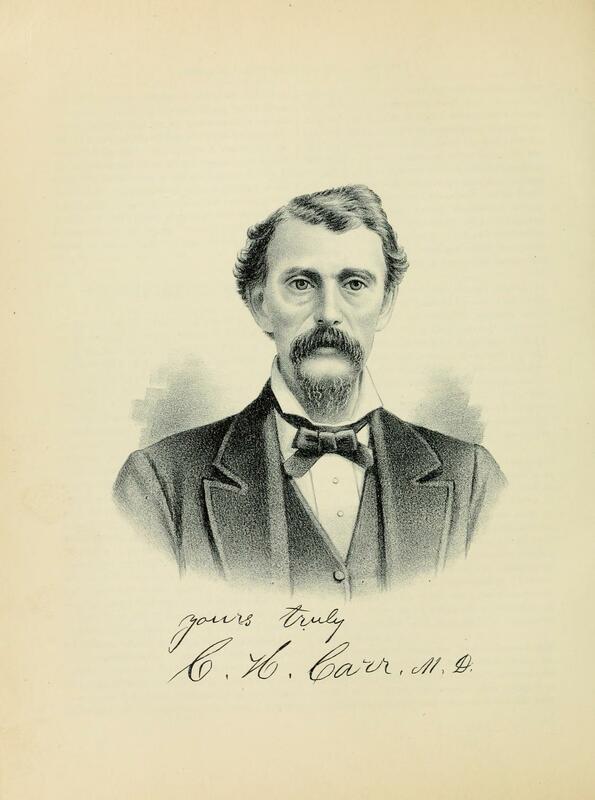 Dr. Carr has established a fine reputation as a practitioner and enjoys a large and lucrative practice in Cowden and vicinity, he is regarded in the community as the leading physician, he attended lectures at the Missouri Medical College at St. Louis, Mo., at which popular institution he made a creditable record. He has always been a close student and has labored hard to gain the standing which he now holds in his profession. Realizing that old age is creeping on, the Doctor has inspired his son Samuel with the desire to receive the mantle of his sire when he shall drop it, and thus to perpetuate the family name in the profession. The Doctor is a worthy member of Joppa Lodge, No. 706, F. & A. M., at Cowden, and a stanch Republican in politics having always voted that ticket, and being regarded as the local leader in his party. In connection with this biographical notice the reader will find a lithographic portrait of Dr. Carr. Extracted 12 Jan 2018 by Norma Hass from 1891 Portrait and Biographical Record of Shelby and Moultrie Counties Illinois, pages 396-398.